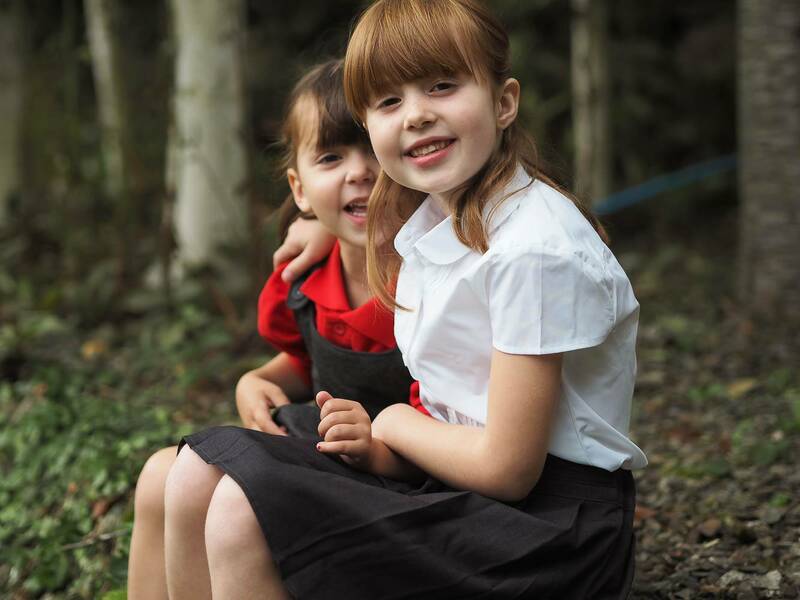 Back To School With Tesco F&F Uniform…100 Day Guarantee! With only two weeks left of the summer holidays to go, it feels like the summer is running away with me and that time that I’ve been putting to the back of mind is fast approaching. I’ve made no secret of the fact that I want the summer holidays to go slowly, as I’m not ready to hand over my little Holly to school just yet. It only seems like yesterday that I was sending Alice off on her first day in reception and now here I am about to do the same with Holly. I can’t quite get my head around the fact that I’m about to have two little school girls. I keep burying my head in the sand and wishing for time to stand still. I know the thought of six weeks summer holidays can feel daunting and there are going to be moments (and there has been!) where it’s not that fun. But I genuinely love having my girls home with me and they love having all this time together. They really are the best friends and yes that does mean squabbles too. But I actually find the more time they spend together the less the squabbles are. I also love not having to do the school run and having more relaxed mornings, where we’re not rushing out the door. Eating far too many ice creams and making the most of the ordinary moments as well as our adventures. I honestly love the summer! I used to be a really organised person, but now I have so many plates spinning that I’m not quite as organised as I used to be. But thankfully with the help of Tesco I’ve got the girls school uniform all sorted. I’m fully prepared that I’m going to cry on Holly’s first day, I will definitely be wearing sunglasses no matter what the weather. What I hadn’t planned on, was crying when she put her uniform on to try it on and have a little photoshoot with me. I know I’m biased but she looks just ridiculously cute and also far too little to be going to school (can’t I just keep her at home!). 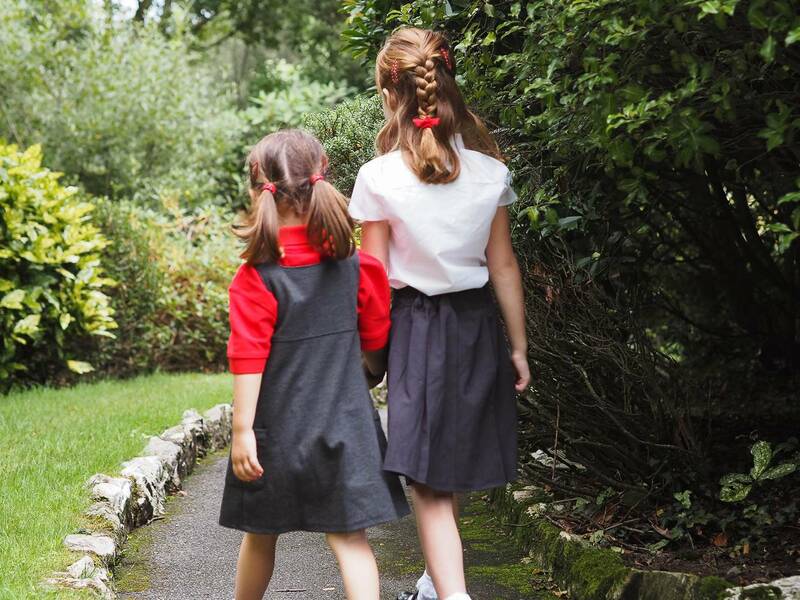 Whilst I’ve brought the girls clothes from Tesco F&F over the years, I haven’t brought school uniform before and I couldn’t wait to see what they had for the girls. I find buying clothes from supermarkets so easy, as whilst we’re there picking up our food we can shop at the same time. 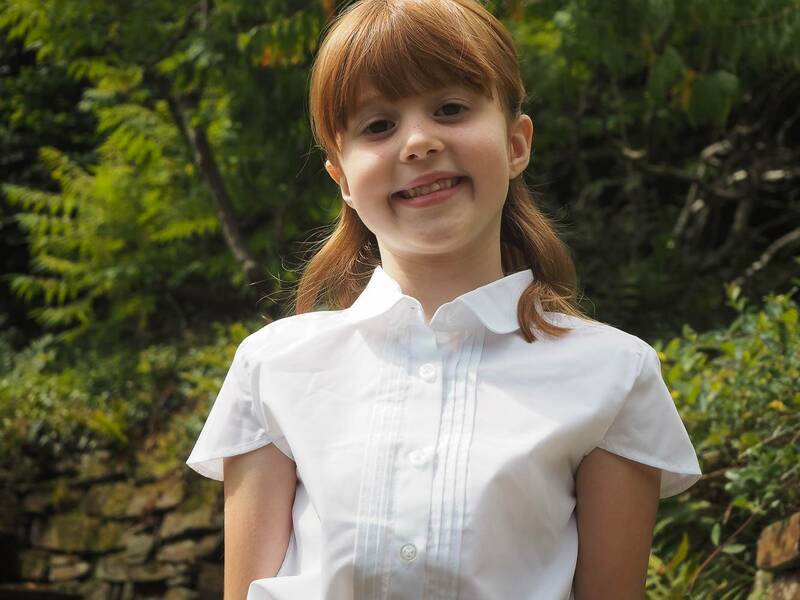 With Alice starting year two when she goes back in September, her uniform changes from the red polo shirt to a blouse and school tie. She is SO excited about wearing the blouse and tie, it’s all she has talked about this summer. 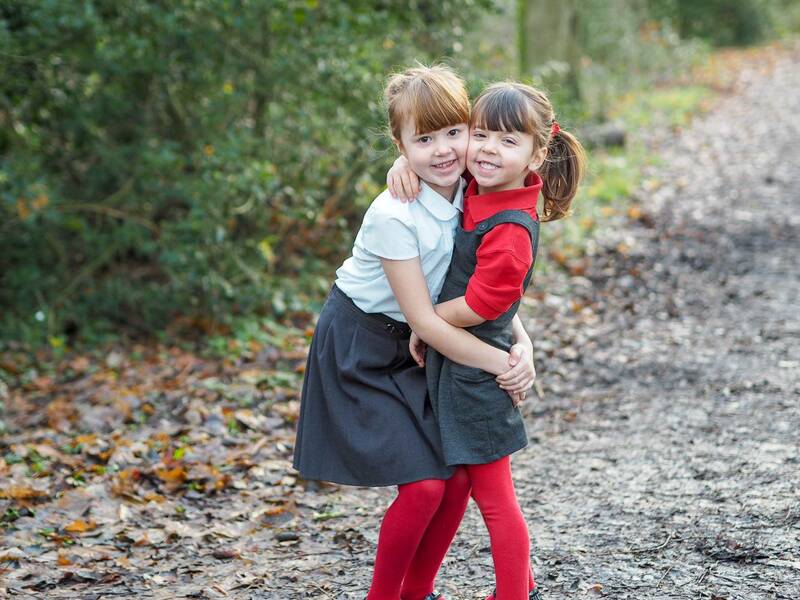 These girls make me so proud and seeing the way Holly is hugging her sister’s arm, well its safe to say I cried. 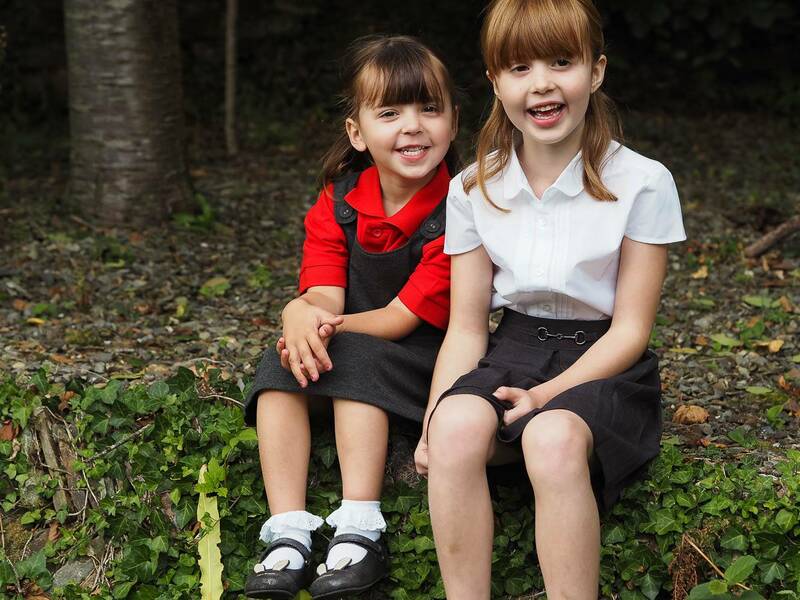 I just know that Alice is going to do a great job of looking after her little sister. Tesco know that children come home covered in stains and I know that little Holly is definitely going to be guilty of this. But its a sign of a fun active day and its something as a school Mum you just have to embrace. But Tesco F&F’s school uniform is doing everything it can to help us out. With their stain repellent and As New technology, your in safe hands. Plus they’ve even guaranteed their uniform for 100 days, giving us confidence and peace of mind that their uniform will last. I adore this girl, she makes my heart burst with pride. She works so hard at school and she loves it too. I can’t get over how smart and grown up she looks in her blouse. I love the details on it and the cap sleeves. Alice said it was really comfortable and easy to do up. Win! I can not sew and I’m always really pleased (and relived) to see that the skirts have adjustable waists. We’ve yet to find a skirt for Alice that doesn’t need taking in and the adjustable waists make it so easy. I was really surprised at the range of school uniform they had. There were several different designs of blouses, skirts and dresses for us to choose from. Meaning there was something for everyone. 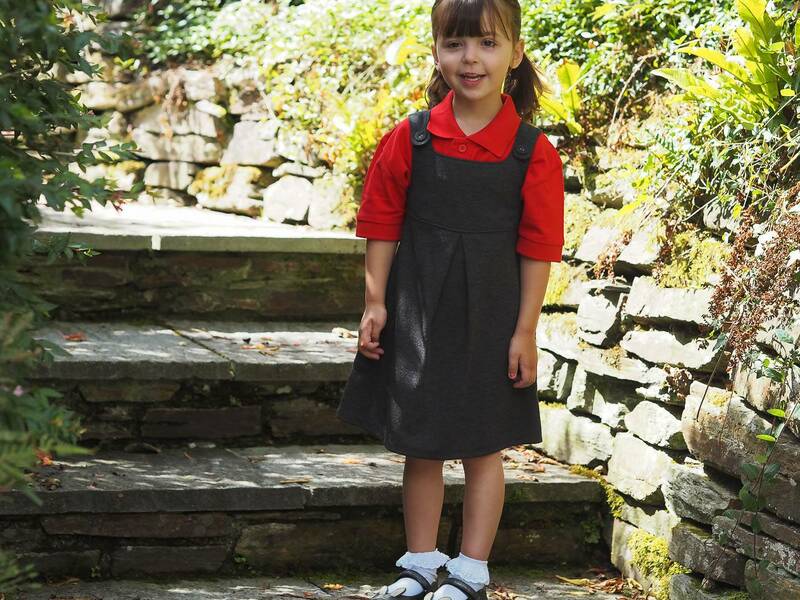 When it came to choosing Holly’s uniform I wanted a dress that would be easy for her (and the teachers!). 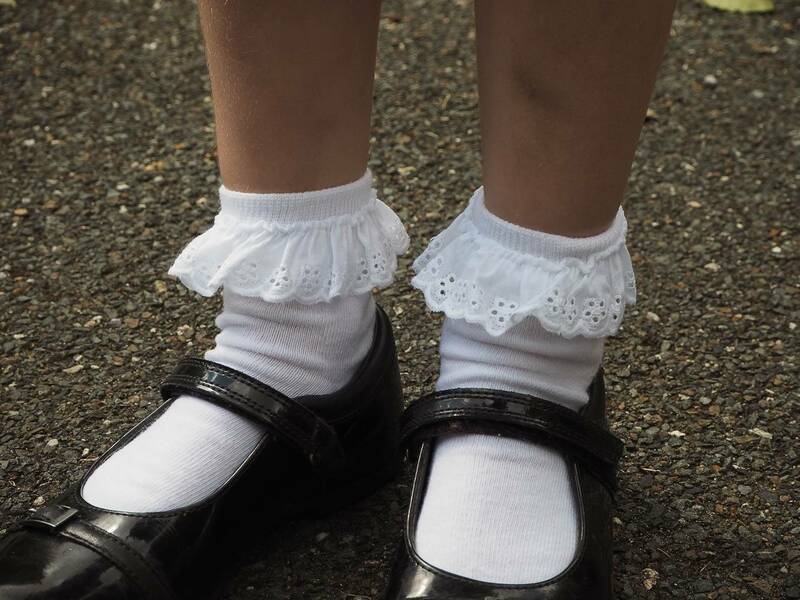 She is going to have PE classes which means getting undressed and dressed again, and whilst she is VERY independent and likes to get dressed herself, of course you still do everything you can to make life easy. I adore this little dress for her, with its cute pockets and button detail. Plus she can put it on, without having to undo the buttons. It just slips right over her head and she managed it no problem. I know I’m a worrier, but when you send your child off to school for the first time and you’re not going to be there to help them. These things make all the difference. We also picked up their cute white socks and hair accessories whilst we were there. It can be hard to find the right red hair bands and clips that we need and I was delighted to see them at Tesco and stocked up on them. 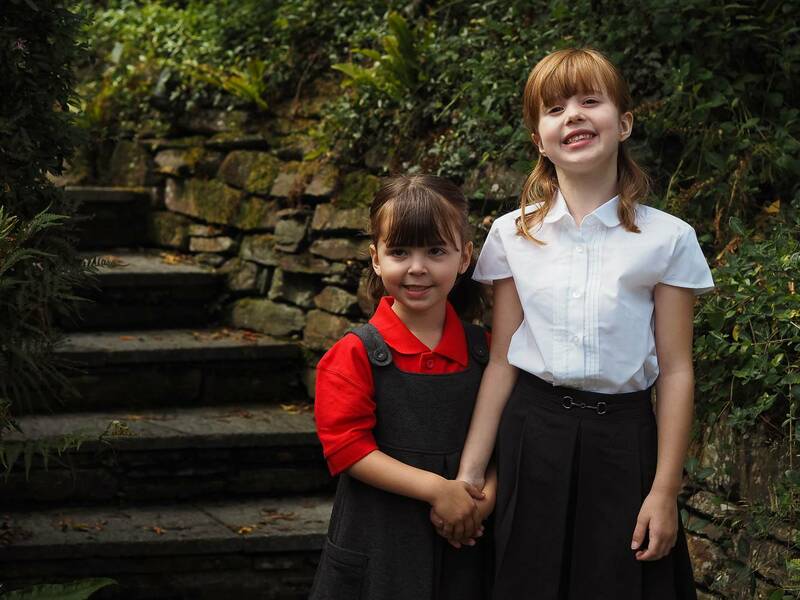 The girls look very smart and said that it was comfortable to wear and I know that especially Holly is going to be putting that 100 day guarantee to the test! I will be sharing with you just before Christmas (I know I mentioned the ‘C’ word! ), to let you know how the uniform is looking with these girls wearing it after 100 days. 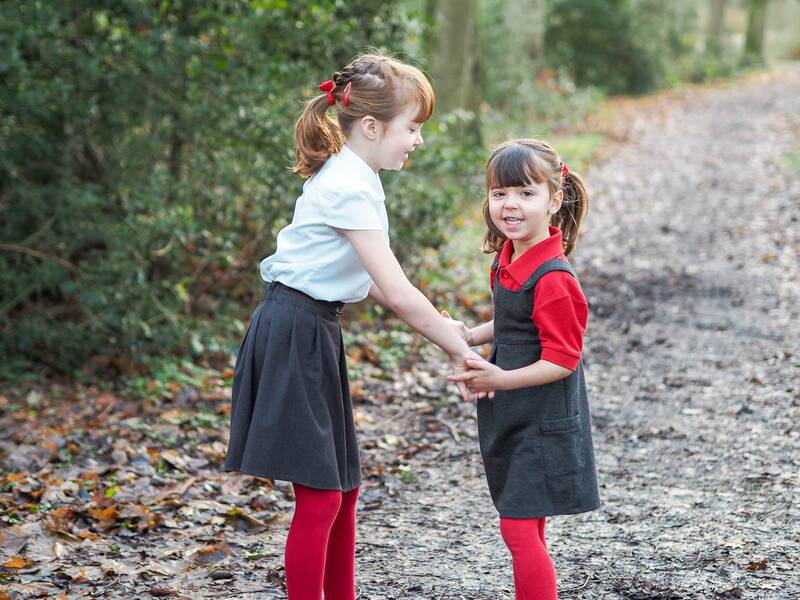 You can buy Tesco F&F school uniform, both instore and online. Its great affordable prices too! 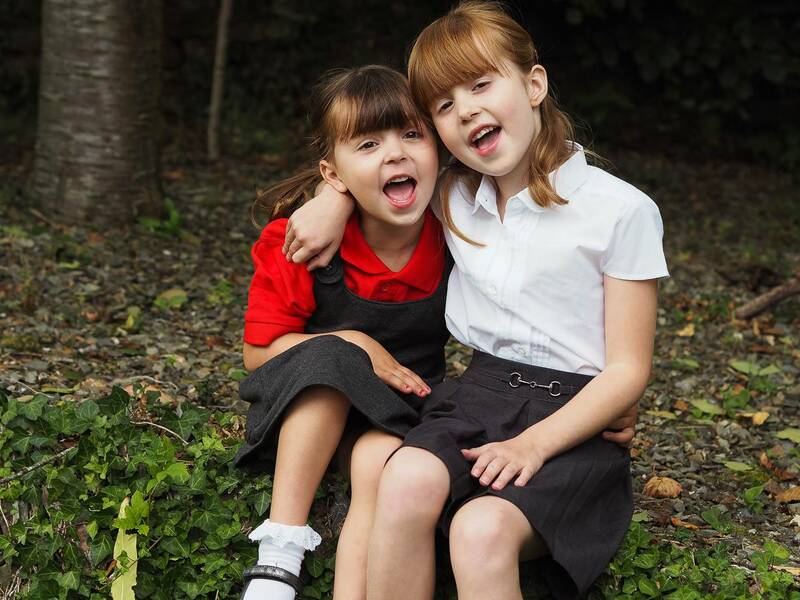 The girls loved their new school uniform and are now even more excited to be going to school together. 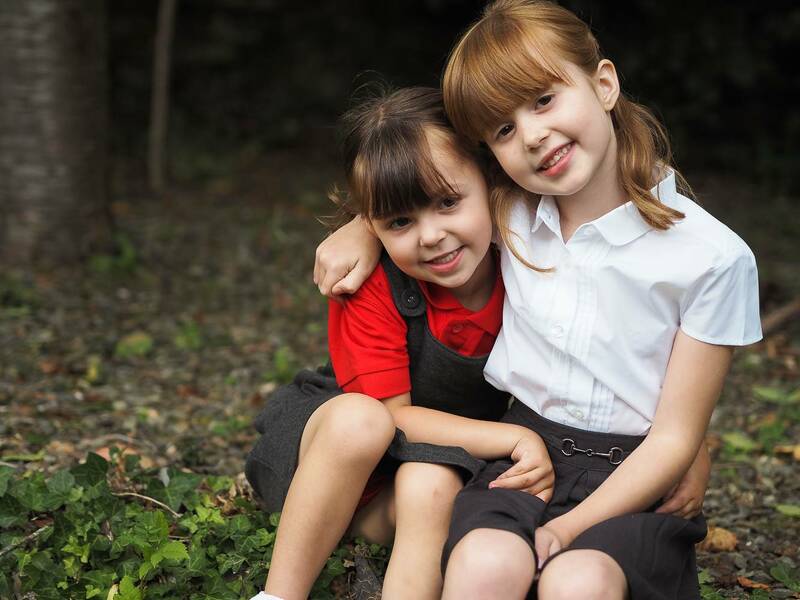 After taking Alice to school everyday for two years, I don’t think Holly can quite believe that she gets to finally join her. Its the teachers I feel sorry for, trying to separate them. The girls have been wearing their uniforms since September and I thought it would be a good idea to give you an update. Firstly, I’m pleased to say that even though Holly has put it to a good test, all their uniform is still in really good condition. Alice’s white shirt, is still white and her skirt is showing no signs of bobbling or anything. Alice also says its the softest skirt she has ever worn. Holly has come home with all sorts down her dress, yoghurt, chalk, paint, you name it, this dress has seen it. Yet, it all washes out and looks good as new. I think the only thing that will stop Holly wearing her dress, is the fact she is growing so fast at the moment, it will be too short. Thank goodness wearing tights in the winter, helps to get a bit more wear out of clothes. A 100 days later, I’m still really happy with their uniforms. The girls are happy to wear them, which is always a win in the mornings and I’m impressed with the condition they are still in. Disclosure: We’re working with Tesco on their back to school campaign. However all views, opinions and content are my own. Your girls look great. I love the cute skirt and dress. Tesco Back to School Range is amazing with the 100 days guarantee. How time flies. 6 weeks seems to go so quick once you’ve made it to the end. How lovely that they now get to go to school together. I’m sure you’ll be fine waving them off – just don’t forget those sun glasses! I have only had to buy school uniform once as after a year of school for our older lad we moved to France where they don’t have uniform at all! How lovely do they look already for the back to school rush! It is great that Tesco offer 100 day guarantee! I had no idea about that and definitely gives you some ease of mind when it comes to quality. My eldest starts reception in 2 weeks. BIG changes ahead. Still need to sort part of his uniform out, so thank you for the reminder! What a great off of 100 days a real test…I am sure little ones can pit clothes through their paces in that time. They look absolutely adorable! Their uniforms are so cute. 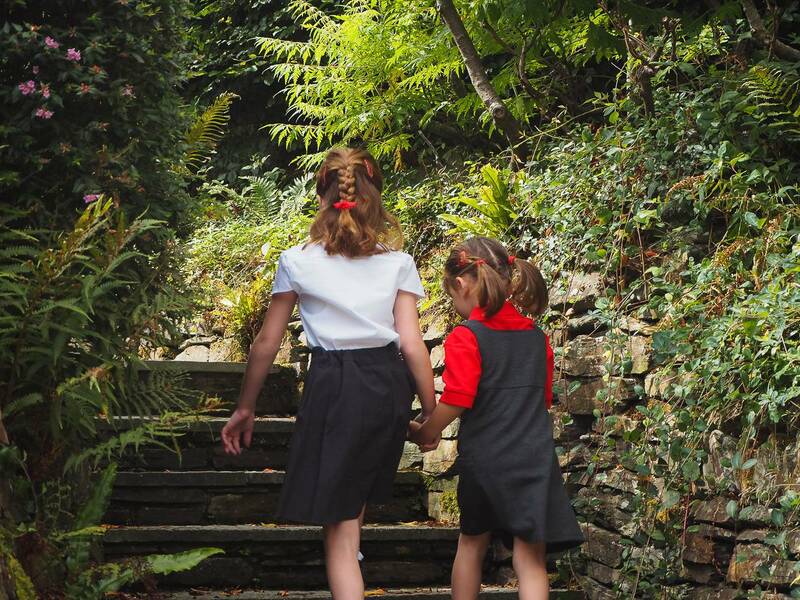 Unfortunately I will never know the joy (and heartache) there comes with your child’s first school uniform as they don’t have uniforms here in Portugal! I’m a bit miffed about that. Love the uniforms, looks well made and durable. The 100 day guarantee is fantastic too! Loving those uniforms. The colors are crisp. They look so adorable! Good to know you can get them at a good price. Aw they look really cute in their new uniforms. I’e not bought mine for Luke yet but it’s on the list for next week! Love the Tesco uniform, it’s always really good quality. Oh wow – look at them both! SO CUTE. 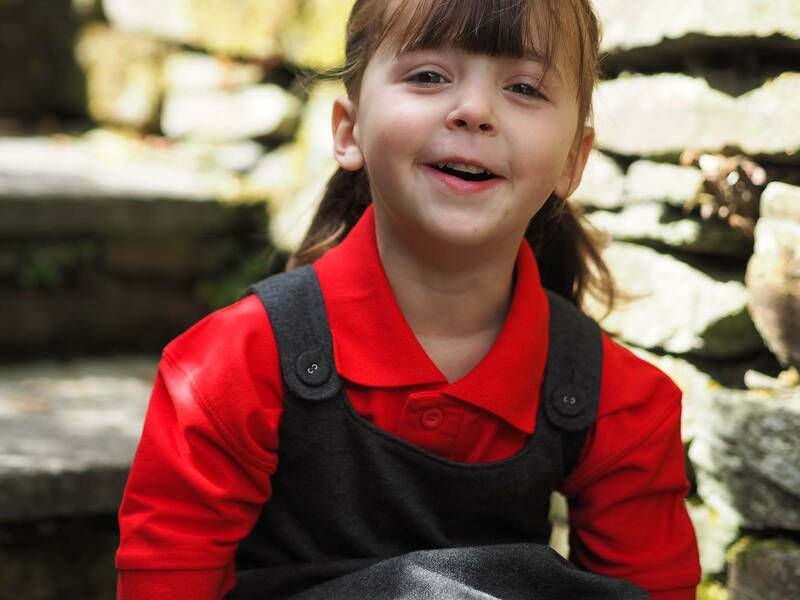 Holly looks super grown up and the red polo shirt is beautiful. Love the details in these uniforms (particularly the adjustable waist!). Sounds like Tesco really have their finger on the pulse of what parents want. 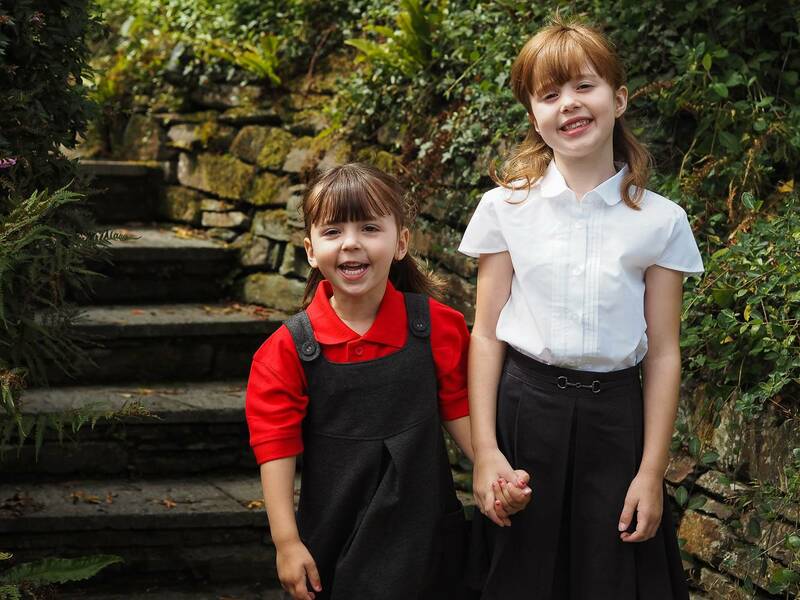 They look so smart in their new uniform, and it’s clear how much they both love it too – those smiles are fantastic! 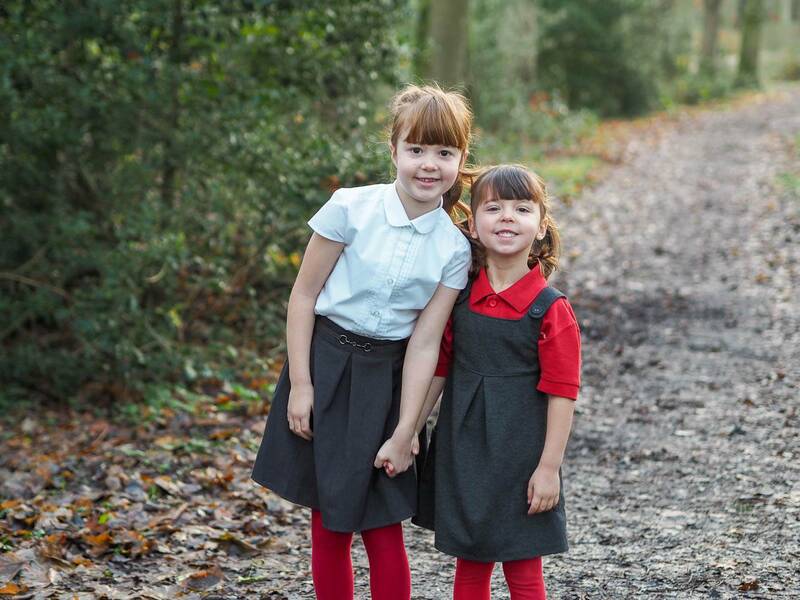 I love Holly’s little pinafore, and how perfect that she can put it on without needing to worry about the buttons. I’m sure she’ll absolutely love school, just like her big sister! 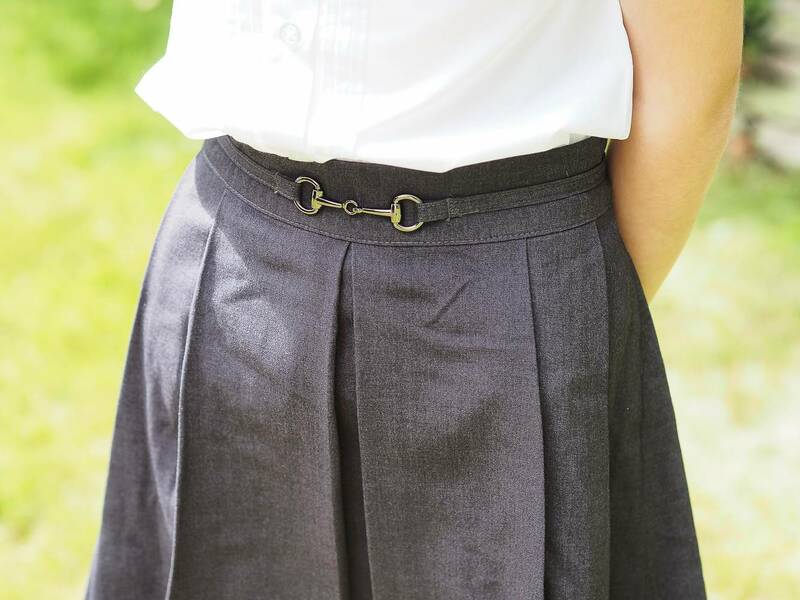 Tesco are brilliant for school uniform, I have found their shirts and trousers to last very well, I really like the skirt with the buckle. Ok I am blown away by the details on the clothing! I can’t believe it’s F&F to be honest, although we buy their clothing regularly. The details are just so lovely on the blouse and on the skirt. It’s lovely that they have a different uniform for the older classes at your school. They look so lovely and smart!! Meme wanted trousers for school this year so I have bought the F&F ones and they are lovely. I must remember this for next year. Ah they are just so adorable!! We love F&F too, you cant beat them for quality and value and they are just SO handy to buy during the weekly shop! Our local Tesco has an amazing range!